New Idea Publishing and award-winning food journalist, Liz Barrett Foster have released "The Peanut Butter Bandit," a young children’s picture book about a mysterious peanut butter thief. 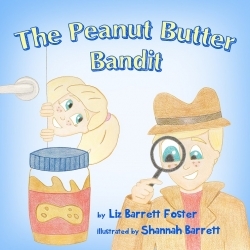 Sardis, MS, January 03, 2019 --(PR.com)-- New Idea Publishing and author Liz Barrett Foster have released "The Peanut Butter Bandit," a young children’s picture book about a mysterious peanut butter thief. In the book, siblings Phillip and Susie must work together to solve the mystery of who has been eating their favorite snack before it’s too late. They search high and low before discovering a surprise they never expected. "The Peanut Butter Bandit" is available for purchase on Amazon.com. Signed copies are available directly from the author. Liz Barrett Foster is a member of the Society of Children’s Books Writers and Illustrators (SCBWI) and an award-winning journalist who has authored more than 1,000 articles. Find out more about Foster at lizbarrettfoster.com. New children's book, The Peanut Butter Bandit, now available on Amazon.com.